“Vienna Idol” organizers, Michael Amouri and Penny Oszak. “I don't think that there's any event like this in Fairfax County where every penny--in fact, more than every penny, because we all come out of pocket to put into it and we don't take it back--that comes from this goes to the Khristin Kyllo memorial fund,” said Amouri. “And everybody that works on the event is a volunteer. None of us are paid to do this, we just want to do it,” said Oszak. Auditions for “Vienna Idol” are ongoing in April and will continue in May. For more information, visit www.viennaidol.org. “Vienna Idol” is an extension of what Vienna is. These are the words of Michael Amouri, owner of Caffe Amouri and one of the main forces behind this annual community event. Simply put, “Vienna Idol” is another take on “American Idol,” but it‘s neither on television nor on YouTube. It’s an outdoor music competition that gives 100 percent of its proceeds and keeps the memory of Khristin Kyllo alive. Let me drive you into Vienna to meet Amouri and hear from him and from Penny Oszak, “Vienna Idol” coordinator. As I enter Vienna, I can feel that I am in the presence of a different kind of a city. Looking at the upper class middle aged women chatting on the bench and the young girls talking while crossing the street, I think the bonds between people are what make Vienna feel different. Now as I enter the cafe, can you see how the same buzz of community feel surrounds me? Coordinator Penny Oszak approached me and guessed correctly. “Yes, I am Hanan Daqqa from Fairfax County Times,” I said and she introduced me to the cheerful and hospitable Michael Amouri. “At Caffe Amouri, part of our mission statement is community. Our mission statement is "quality, community, and sustainability." And we're very into the community aspect of it. But this is the one thing we do every year that means the most to me [“Vienna Idol”]. I mean, we've raised over eighty thousand dollars in seven years. This year, I'm really pushing, I want to go over a hundred thousand dollars, and send three more kids to college and purchase more seizure monitors,” said Amouri who, in addition to his interest in community building, comes from a family that loves music--his father was a church choir director for over forty years. And when you enter the cafe, you can see his collection of albums on the walls. 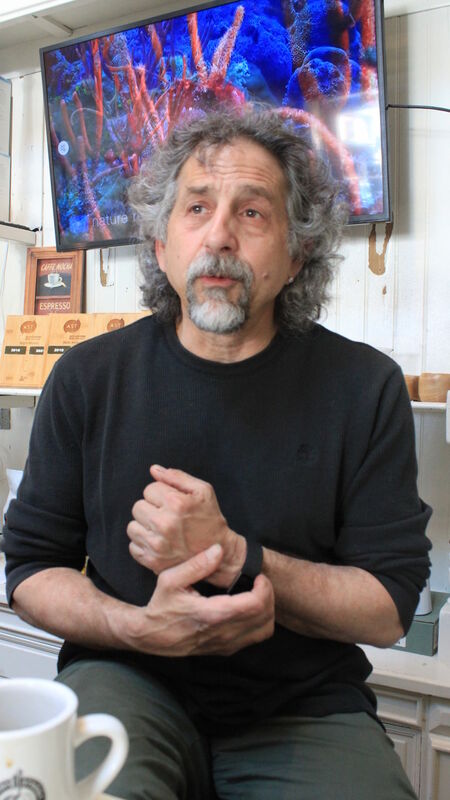 He has a background in television production after years of working as a freelancer with media companies before he opened his cafe..
“So, how did the idea of “Vienna Idol” come about?” I asked after receiving my cappuccino and a hearty slice of coffee cake. Oszak pointed at Amouri for an answer. AMOURI: Caffe Amouri opened in 2010, and in, I believe it was 2011, a young woman who went to James Madison High School named Khristin Kyllo… I had coached her in junior varsity basketball--she went on to play varsity basketball--she passed away in her dorm room in college to SUDEP, which is sudden unexpected death from epilepsy. It's a disease of the brain that very little was known about and is still not known about. Her parents, Tom and Julie Kyllo, who are friends of mine, in an act of what I think is about the bravest thing a parent can do, when their child just died that first year, they decided to do something called "Kyllo Palooza." They got a bunch of people together, and it was so heartfelt and it was so good to see all the kids have a chance to get there and honor their friend in something (she loved music) in a way that was meaningful for them to remember her. So, the next year, we said, "You know, we really want to do something." We decided to do this “Vienna Idol.” And we talked to Tom and Julie and they were all on board. So we said, "Let's do this to raise money for a good cause." So, it was sort of like, you know, Mickey Rooney in an old movie, like, "I got a barn, I got some paint, let's put on a show." We didn't know what we were doing. We went to Whole Foods, and they agreed to sort of come on board with us. And that's really where it got started. That first year, we were amazed. We were overwhelmed by the success of it. The proceeds from “Vienna Idol” go to three things. The first is that, Tom and Julie will tell you that Khristin had big dreams. She was a little, tiny thing that had these huge dreams in her life. So, they started a scholarship fund called the "Dream Big Scholarship." It is for James Madison High School students who face significant challenges in their life, and these challenges might prohibit them from going to college. It might be that they're from a single-parent household and they can't afford it. So, every year, they get essays that students submit and they choose one or two or more scholarships to give these kids a chance to go to college. And one of the things that I love about that is that if you want to talk about keeping Khristin almost memorialized, imagine that you're some guy or some girl 20 years down the road, and you're with your family, and you got a nice house, and you got a nice job, and you tell your family, "You know, the reason we have this is that I was able to go to college because of Khristin Kyllo and she passed away. Because of what her parents did, I was able to do all this." To me, that keeps her alive forever. Now, up to date, they've given 15 college scholarships out. We're in our eighth year this year, going into our eighth year. The second thing they do is they purchase seizure monitors and monitoring. Epilepsy sufferers wear the seizure monitor so that if they have a seizure, it will automatically alert emergency personnel. One of the most heartfelt, emotional things that ever happened with the first seizure monitor we gave away to a student was that she wrote a letter back to the Kyllos and said how much she was thanking them for this because she could live a normal life. She could go to college without the fear that a seizure was going to kill her. So, we gave that child freedom from her epilepsy suffering. OSZAK: And her parents. Yeah, her parents are comforted knowing that somebody would be notified. I mean, if Khristin had had one, she'd probably still be with us. AMOURI: She'd be alive today, right. DAQQA: and the third thing that the proceeds go to? AMOURI: The third thing is for SUDEP research. SUDEP is a very not understood disease of the brain that doesn’t get a ton of attention and research dollars. DAQQA: So, her parents, Tom and Julie, what is their role? AMOURI: Oh, their role, it's all over it. It's all over it. DAQQA: But you are the one who started it? OSZAK: He started it, but he got Tom to obviously agree and support it; they're very much a part of this. Tom's one of the judges for the event. Julie does all the printing, she's running around pasting fliers today. She sets up a table when we have the finals on the Town Green. She has the table for epilepsy awareness with all kinds of materials. They usually bring a watch so people can see what the watch looks like. So, they're very involved. DAQQA: How much does a seizure monitor cost? AMOURI: Twelve hundred dollars. Something like that. Twelve, plus monitoring. You purchase the watch and then you have to pay for round-the-clock, twenty-four-seven monitoring of the watch. And so, we get both of those, the monitoring and the watch, for them. And it's usually for families that can't afford it, but their kid has epilepsy, so what are they going to do? Just suffer and worry? DAQQA: When is the event? Oszak: Well, we started auditions on the 4th of April. So, we have auditions twice a week in April and May. And then we have the semi-finals at ViVa! Vienna!, right out here in the parking lot. ViVa Vienna's a big event for Vienna. So, there are lots and lots of people that come. And then we have the finale on the Town Green on the 7th of June. And it's on a Friday night, so everybody comes. AMOURI: Last year, we had between four and five hundred people. And it's a Friday night. It's like a little mini Woodstock. There are kids and there are beach balls, and they're throwing Frisbee discs around. But there are usually five or six finalists, and the way they win is that people vote for them with their dollars. So, we do a first round, and everybody goes up and they vote for who they want to win. That's our last way of making money: they're voting with their dollars and the person who makes the most money wins the contest, and last year we made about thirteen thousand dollars. DAQQA: How much do they pay to vote? Here's the way it works: After the auditions (we normally audition around 40 people) the 15 semi-finalists square off during the big town event ViVa! Vienna!. Hundreds (if not thousands) see these semi finals. Along the way, we earn money in two ways: sponsorships and by passing around a big water jug at all auditions. We normally get about $1500 from the jugs, with the big money coming from the sponsorships. This is significant because most of the sponsors are small businesses, just like us, who each contribute $500 to be a part of this special event. And, speaking as a small business owner, $500 is significant! Now, for the finals, we usually have 5 finalists. At the back of the lawn of the Vienna Town Green, we have a big bucket for each of the finalists. As they perform, folks "vote" by dropping tickets into the bucket of the contestant of their choice. Each ticket is worth $1. It's sort of like the online voting that they used to do (maybe still do) on “American Idol.” Our goal for the finals is to put on such a great show that folks are happy to donate--not just for the artists and their chances of winning, but for the Khristin Kyllo Memorial Fund itself. DAQQA: Is it only for Vienna students? OSZAK: No, no. Anybody can do it. AMOURI: And it's not students. A very important part of this is... What's the minimum age? AMOURI: So, you have to be twelve. But it's one of the things that we really want people to know is that we have...I mean, two years ago we had a woman who was like 72. So, it's for any musician. AMOURI: Anywhere. So, if you want to come in here from Oregon, we'll take you in. OSZAK: We've got somebody signed up from West Virginia already. AMOURI: … if they win “Vienna Idol,” generally, they're booked to play in other town events as a “Vienna Idol” winner. So, it's really cool for the musicians to have an opportunity to showcase their talent. OSZAK: Plus, they get money. They get seven hundred dollars and professional recording time; they get eight hours of professional recording time at Clue Studios out in Falls Church (that's one of our sponsors). AMOURI: Which is worth about twelve hundred dollars. And plus a seven hundred dollar prize. So, there are wonderful cash prizes as well. Looking at the cup in Amouri’s hand, I recognized writing that resembled Arabic on it. Amouri, who grew up in DC and has been a Vienna resident since 1987, is a second-generation Lebanese American. This is how Oszak became involved: “We come into the shop everyday and we always talk to him. And we came into the shop and he was, like, "Hey, I got this idea. I want to do a take on 'American Idol' and we're going to call it ‘Vienna Idol,’”and my husband and I looked at each other. So, he said he was going to have auditions. And we went to one of the first auditions, and he was up there by himself doing everything, by himself. So, my husband said, "Um, do you need some help with the sound?" So, my husband does the sound. And then his neighbor said, "Do you need some help with project management stuff?" And he said yes. So then, I just started helping with the coordination, doing more of the project management stuff. So, we all wanted to participate. Michael does that to you,” said Oszak. What do former participants of “Vienna Idol” say? “My great friend Norm Morin and I are next door neighbors in Vienna, Va. who both happen to play guitar. We had started playing around for fun a number of years ago and decided to try out for “Vienna Idol.” It was one of the best decisions either of us have ever made. Through ‘Vienna Idol,’ we were introduced to an amazing group of people, made many new friends, and were given an opportunity to become active participants in an incredible local music scene as well as in town events, such as Viva! Vienna! and Oktoberfest. We also launched our own local music career, regularly playing at local wineries and breweries as an acoustic duo, Falling Home.